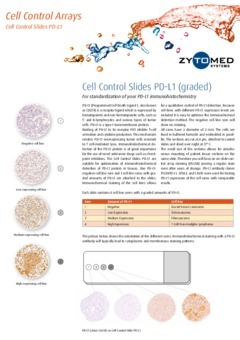 Here you will find product flyers and information on our products in the Cell Control Arrays area, which you can download as PDF files. PD-L1 (Programmed Cell Death Ligand 1, also known as CD274) is a receptor ligand which is expressed by hematopoietic and non-hematopoietic cells, such as T- and B-lymphocytes and various types of tumor cells. Our Control Arrays are homogenous paraffin blocks with different numbers of embedded cell lines. These micro arrays are so small that you can mount them together with the sample of interest e.g. patient specimen on one slide. This „On-slide-controlstaining“ enables you to archive the staining control together with the investigated sample, proving the reliability of your stains even after years.